Before the UConn women’s basketball team takes on No. 10 Oregon in the Bridgeport regional final, Daily Campus Sports Editor Dan Madigan caught up with Jon Hawthorne, Associate Sports Editor of The Daily Emerald, the University of Oregon’s independent paper, to learn some more about the Ducks. Here’s what Hawthorne said as the Huskies look for a chance to advance to their 10th-straight Final Four. Madigan: What has it been like watching a team that is so inexperienced (the Ducks start three freshmen and a sophomore) yet so talented develop over the course of this season? Hawthorne: It's definitely been a unique experience. Some nights they look like a top-10 team. Other nights they look out of sorts. But I can unequivocally say that this team has grown dramatically during the season. With such a young team, there's such a dramatic curve for improvement. Case in point on defense. The Ducks have, as of late, become one of the Pac-12's best defensive teams in March. That's only because it took a while for it to click. Off the court, this team is loose, energetic and fun to be around. From following their recruiting, it's been great to see how the players have molded into an Elite Eight team. Madigan: What went right in the win over No. 3 Maryland? Hawthorne: Everything. The Ducks fired on all cylinders. They didn't hesitate when it came time to shoot 3-pointers, which has sometimes been the case this year. They played some of their best defense. They straight up came to play. The team's coaches have preached all season that a team with nothing to lose can be dangerous. That's one of head coach Kelly Graves' favorite sayings. They truly took that to heart against the Terrapins. Madigan: At a higher level, what are the Ducks' biggest strengths and weaknesses? Hawthorne: Oregon is one of the best offensive teams in the country. The Ducks have also been able to find the big shot when it matters, especially in wins over Temple and Cal. They shoot the 3-pointer well and have scoring ability from every player on the court. At times this season, turnovers have been a problem, but not as much in the NCAA Tournament. This year's team has a "whatever it takes" mentality that's helped them get this far. Madigan: Freshman Sabrina Ionescu leads the country in triple-doubles as a freshman and was brilliant against Maryland. What's the best skill that she brings to the Ducks and what will she need to do against UConn to send the Ducks to the Final Four? Hawthorne: She's just flat out fearless. She's confident in her abilities and knows that she can hang with any of the nation's top players. I think she's best at seeing her teammates open, but she's not afraid to take a big shot when it counts. She's the real deal and is much-deserving of National Freshman of the Year honors. 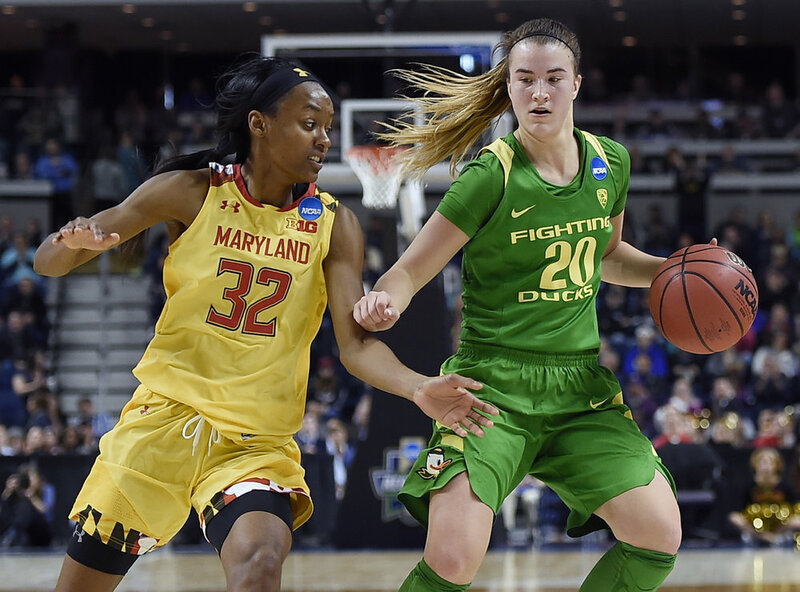 Madigan: Aside from Ionescu and star freshman Ruthy Hebard, what other Oregon players are crucial to the Ducks' success? Hawthorne: Mallory McGwire must stay out of foul trouble and Lexi Bando needs to find her groove from beyond the arc. That will be difficult to do against UConn's strong defense, though. The Ducks will need every player to be on point for the upset of college basketball's elite team.